OVERVIEW: After faking their deaths to escape from prison, Ember Miller and Chase Jennings have only one goal: to lay low until the Federal Bureau of Reformation forgets they ever existed. FORMAT: Breaking Point is the second novel in the Article 5 trilogy. It is a fast-paced, dystopian YA novel. There are parts that are extremely 'dark', which makes it more of an 'older' YA novel. The novel stands at 400 pages and was published by Tor Teen on February 12, 2013. ANALYSIS: Breaking Point is the second novel in Kristen Simmon's Article 5 trilogy. The first novel, titled Article 5, was absolutely amazing. Sure, it wasn't without its flaws, but I found it captivating, intriguing, and dark. 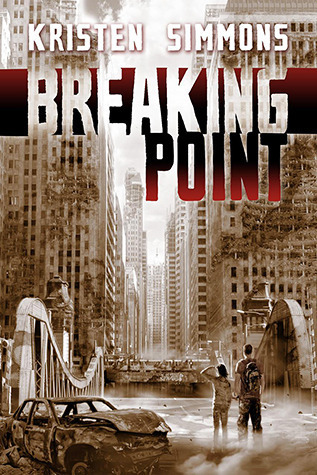 I had hopes that Breaking Point would live up to that novel, and it did, but not in the ways that I thought. Coming fresh off of Article 5, I was hoping that Breaking Point would keep up the fast-paced, high powered theme. It didn't really live up to that. Instead, readers are treated to a slower paced novel that focuses more of character interactions, character development, and plot development. That is not to say the novel is 'slow' or 'bogged down' with details/action, it just is a bit slower. Most of Breaking Point is focused upon showing readers how Ember is looking at the things she's done, how's she's reacted, and how far she's grown. Kristen Simmons writes these scenes in such a way that readers are reminded of how Ember acted, but are able to see a small glimpse into the woman that Ember is becoming. One of my biggest frustrations in Article 5 was how immature and 'stupid' Ember could be at times. Breaking Point acknowledged her 'stupidity' and really showed that Ember realized how immature she was and was trying to grow and change. I found this refreshing. I am not sure if this was done on purpose to address the issue from the first book, or if it was planned. But it worked. Breaking Point is a lot like the first book. This means if you didn't like the dark setting or the way characters acted/interacted, this will definitely not change your mind. On the other hand, if you loved the first novel, you may find the slower pace of this novel a bit 'off putting'. Kristen Simmons has shown that Article 5, her first novel, wasn't some 'one hit wonder'. She showed that she has the grace, style, and talent to carry it into a second and hopefully a third novel. I am confident that she will end this series with a bang. Just think of Breaking Point as a set up for the big finale. I should warn you. If you are one of those that hates cliff-hangers and don't like being left out in the cold. I would recommend waiting for the third novel to come out. Among an I number every time larger of authors that walk in the shadows detached the mysterious C.S. Scriblerius, believed is a pseudonym as of Twelve Hawks. The mysterious man without face announces his production as a writer that nobody saw and whose identity is the subject starting from their writings pages. Everything that it is known about those authors the book MAGICAL MYSTERY TRAVEL and their works as ””Percyfaw Code””,de Scriblerius, made available by limited time as e-book in an apparent strategy of marketing of enormous success in the web and ””The Traveler””, Twelve Hawks published amid the style of Hollywood hype where disembarked in the list bestseller of the newspaper The New Times.The mysterious to Thomas Pynchon’s same style, Philip Roth, JD Salinger,B.Traven, Cormac McCarthy, authors C.S. Scriblerius and Twelve Hawks “live out of the grating”, meaning that you chose roads no so conventional in the market editorial, using like this other means for popularization of their works,and, hindering of they be tracked.